Receipts were 912, including 204 packer cows, bred cows and pairs, 708 yearlings and calves. Packer cows were steady to $2 higher. Packer bulls were $2 to $4 higher. 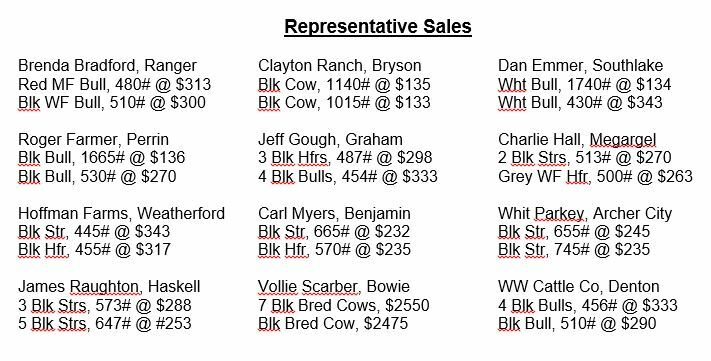 Market on replacement cows and pairs was steady to last week’s higher market. Market on steers and heifers weighing 500# and under was steady to last week’s market. Feeder steers and heifers weighing over 500# was steady but not a good test. The market is still excellent with the cattle that is going to wheat bringing premium price. Receipts were 1658, including 357 packer cows, bred cows and pairs, 1301 yearlings and calves. Packer cows were steady to $2 higher. Packer bulls were steady to $3 higher. 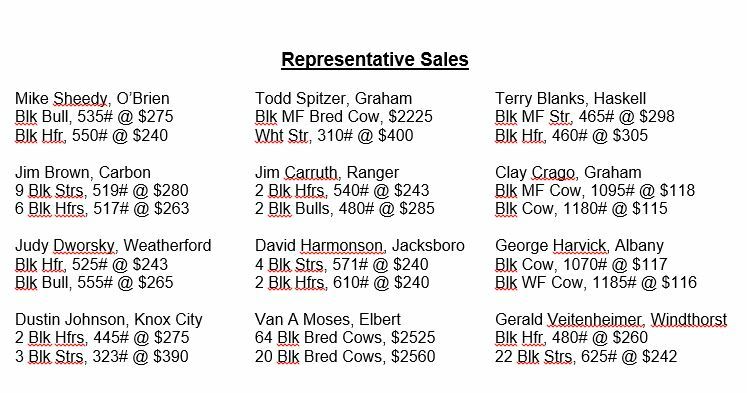 Market on replacement cows and pairs was steady to last week’s higher market. Market on steers and heifers weighing 500# and under was $6 to $10 higher with a good demand. Feeder steers and heifers weighing over 500# was $4 to $6 higher. We had a good run today with a good demand on the light cattle going to wheat pasture. Receipts were 2406, including 695 packer cows, bred cows and pairs, 1711 yearlings and calves. Packer cows were steady to $1 higher. Packer bulls were steady. Market on replacement cows and pairs was $150-$200 higher on the better quality cows. Market on steers and heifers weighing 500# and under was steady to $2 higher. Feeder steers and heifers weighing over 500# was steady to last week’s market. We had a good run of replacement cows with the market being very active.